This is really a game of observation. It will drive people crazy and is even more fun when a few of your quests realize what's happening. Even when you make it blindingly obvious a few people will fail to see what your doing! Get hold of 10 teaspoons. Kneel on the ground. Make a pattern using the spoons on the carpet so that all your guests can see what you're doing. With your palms face down reveal 5 fingers making sure that the rest of your fingers are not outstretched, but at this stage don't make it too obvious what you're doing. Then ask your guests collectively if by looking at the formation of the spoons if they can guess what number this represents. The answer in this case is 5, and has nothing to do with the 10 spoons, but with your exposed fingers and thumbs. 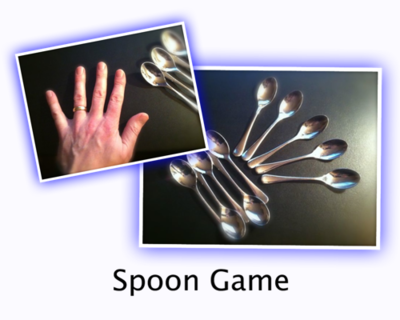 If nobody guesses the code after the first round collect up all the spoons and make a new pattern. Again place your hands palms down exposing as many fingers and thumbs as you wish. If you have for example 7 fingers/thumbs fully outstretched (the rest folded back) then the answer to your pattern is 7 and so on. Keep creating new patterns while at the same time showing more/less fingers. Just played with my kids (12 and 17) they couldn't figure it out...but once I told them they loved it. wot code can they break? Hahaha, I played this once at a friends house, except I was using a coin. They got so confused , they had no idea what the trick was, when one of my friends got it right every time. I eventually ended up telling them.